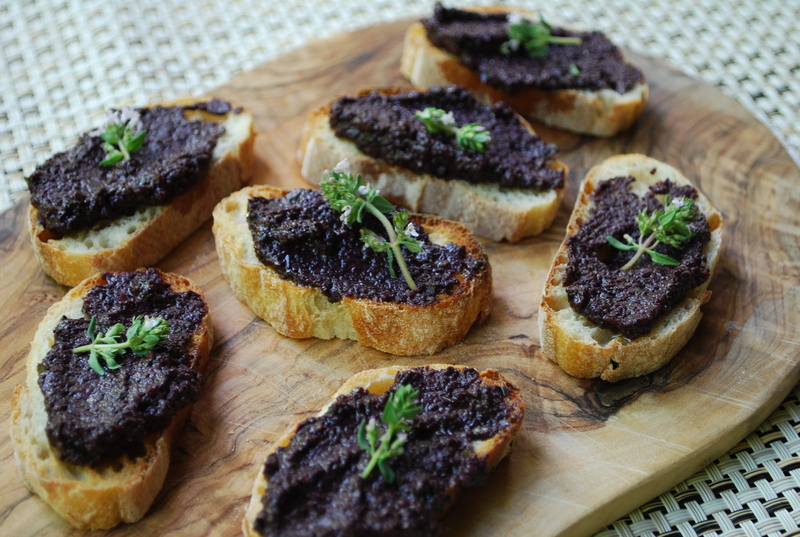 Did you know that most traditional tapenade has anchovies in it? I naively bought some tapenade in one of my favourite stores and promptly wolfed it down on really nice home-made crostini. I decided I really like tapenade. So the next time I had a craving I decided to make it. I had olives. I had salt. What else could you need? Well, after going through 5 or 6 recipe books I soon realized that you need anchovies! Of course, you don’t need anchovies. It’s just that, as I said, most traditional tapenade has anchovies in it. So I modified the recipe and now I love it even more! The other thing I should say here is that 2 of the things I found particularly difficult about going vegan were breakfast and snacks. Breakfast was often milk-based, as it is for many of us with few apparent alternatives. And snacks were usually really cheesy because cheese is so good and so easy to grab on the go, or nibble on before dinner, or stick on a piece of toast (one of my childhood favourites). I’ll tell you about my breakfast routine later. As for snacks, I’ve discovered the joys of things like hummous and tapenade and other vegan delights. Here’s the recipe which I’ve doubled for you since it’s too good and too convenient to make just one batch. Throw it all into a food processor and blend until you get the consistency you like. Let it sit at room temperature for awhile so the flavours meld. Spread it on really yummy homemade crostini and snack away. I’m going to try making this – can you post Andrew’s crostini recipe? I think I know it but not positive. Baguette toasted and then brush on olive oil, sea salt (rosemary?). LOVE THIS BLOG SO MUCH!!!!! Sorry I’m a day or two behind here. YES! Cut a (stale) baguette into very thin slices. Place flat on a cookie sheet and bake at low heat (250) in the oven until golden brown. Take them out and then brush with olive oil and sprinkle with sea salt. You can of course finely finely chop rosemary and add it to the olive oil or, alternatively, heat the olive oil with a big sprig of rosemary so that the flavour transfers to the oil, then brush on. I will do a proper post with a proper picture but wanted you to get the goods ASAP. So glad you’re loving the blog. will try this way instead – love the idea of infusing with rosemary! !